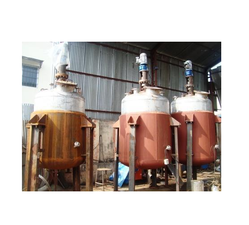 Offering you a complete choice of products which include jacket non gmp reactor. The jacket design consists of an outer jacket which surrounds the vessel. Heat transfer fluid flows around the jacket and is injected at high velocitythrough nozzles. The temperature in the jacket is regulated to control heating or cooling. The single jacket is probably the oldest design of external cooling jacket. Despite being a tried and tested solution, it has some limitations. On large vessels, it can take many minutes to adjust the temperature of the fluid in the cooling jacket. This results in sluggish temperature control. Looking for Jacket Reactot Non GMP ?